Perfect for all types of users, this boutique building boasts exposed brick & wood loft construction, offering unique opportunities in the heart of Chicago's most sought after River North neighborhood. 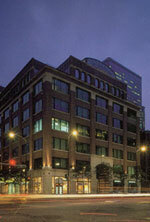 Conveniently located just north of the Chicago River in popular River North area. Classic lobby incorporating historic stateliness via mahogany, terrazzo, coffered ceilings, and many other exquisite appointments. Choice of exposed heavy timber or concealed ceilings in office suites. Ceramic tiled washrooms on every floor. High security protection though vestibule elevator and security officer after 5PM.